This page should allow any Alfa Romeo Giulietta-Giulia Spider owners or enthusiasts a quick and easy reference and a place to share pictures of Alfa Romeo Giulietta-Giulia Spider 's. 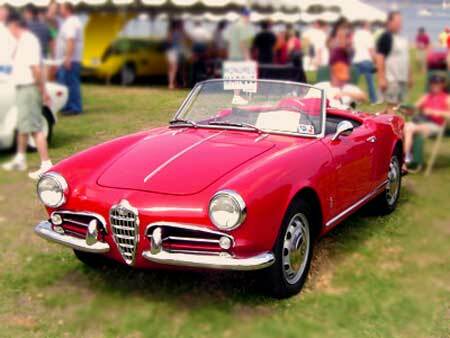 Technical specifications are also listed on this page as are Alfa Romeo Giulietta-Giulia Spider 's for sale, Alfa Romeo Giulietta-Giulia Spider spare parts and Alfa Romeo Giulietta-Giulia Spider books and memorabilia. If you cannot find what you are looking for on this page then feel free to use the Goggle Search feature below to search the web for more Alfa Romeo Giulietta-Giulia Spider information. After World War II Alfa Romeo could no longer afford to produce purely the bespoke motor cars that had made the marque famous on both road and track. It was not until 1954 that Alfa found its savior in the Giulietta Sprint, Nuccio Bertone being commissioned to design this small coupe just weeks before its debut at the Turin Show. The resultant shape pleased the eye from any angle, but Bertone's styling for the convertible model was less appealing and the design was passed to Pinin Farina; using a chassis seven inches shorter than the Bertone coupe, the Spider was equally as graceful. The initial 750 Series Giulietta chassis featured independent front suspension with a coil-sprung live rear axle and drum brakes all round. The engine, like the suspension, owed much to Alfa's racing experience, hence the ability of the twin-cam four cylinder to produce 65 bhp from just 1290 cc. Major changes appeared in 1959 with the 101 Series. Though outwardly similar, the 1290 cc engine was strengthened while the bodies received minor detail alterations. The final change came in 1962 when the renamed Giulia models appeared with five-speed gearboxes and a 92-bhp, 1570 cc version of the twin-cam engine.